The pentatonic scale is, to the vast majority of guitarists, the ‘home court’ of the fretboard. It’s up there with the major and minor as one of the ‘primary’ scales which will form your basic understanding of the fretboard. In all likelihood, it will also be the scale you’ll grow most to rely on as a lead guitarist. As such it’s important you develop a solid grasp on it, and that’s what this series is about. 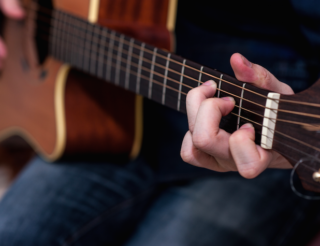 So, what is the pentatonic? Well, ‘Penta’ is the prefix for anything relating to the number five; the Pentagon building is so named for having 5-sides, that satanic star thing you wouldn’t want to find your sleepwalking daughter painting on the bathroom mirror in her own blood is called a pentagram because it has five points. Now the pentatonic scales in Western music are cut from their corresponding natural scales, comprising of 5 notes instead of the normal 7. 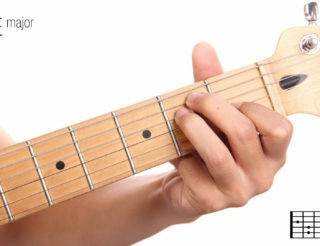 The minor pentatonic consists of the 1, 3, 4, 5 and 7th notes of the natural minor of the underlying chord. 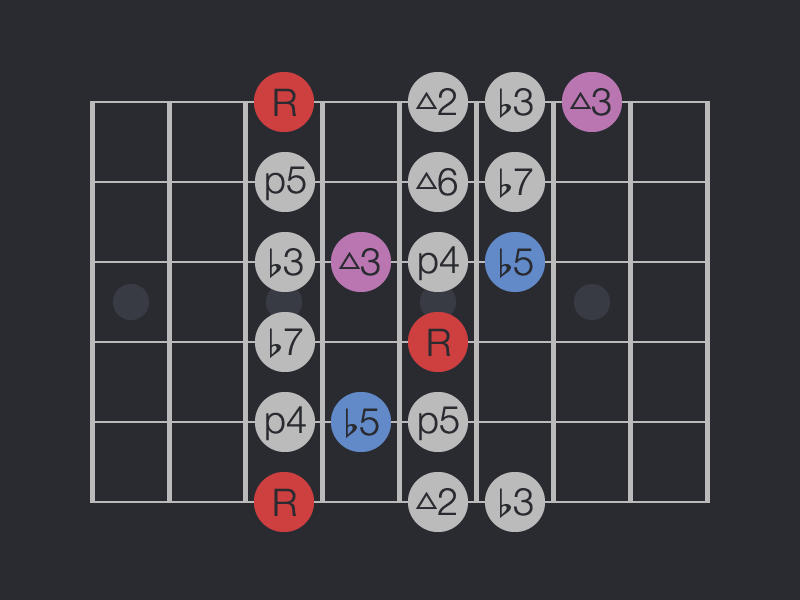 For the major pentatonic, this would be the 1, 2, 3, 5 and 6th notes of the major scale. Before I ignite the wrath of guitar purists, let me state that I’m using the term ‘pentatonic’ very loosely here. 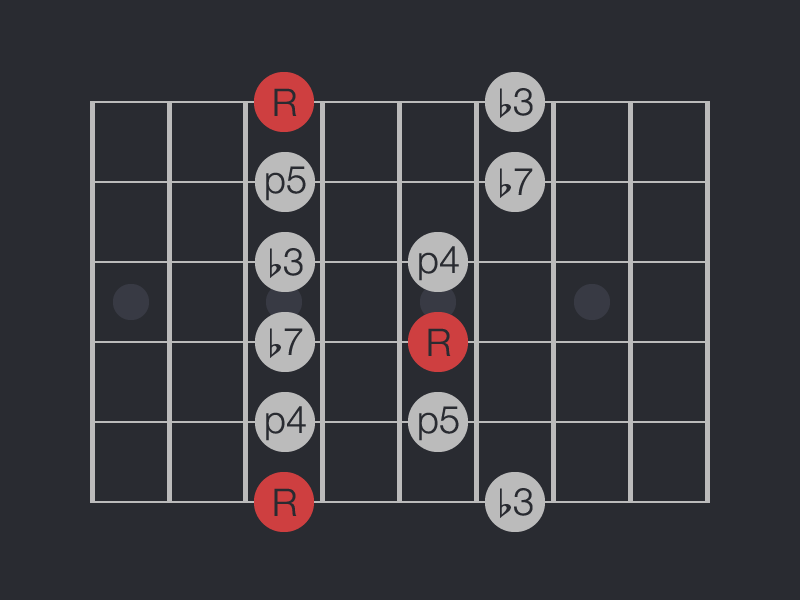 Instead of strictly seeing the pentatonic as a five-tone scale, which it is, I’d rather you look down at your fretboard and see not just the outlines of the ‘box positions’ but a network of potential notes for you to play. Let’s use the term pentatonic framework instead. Behold. This is the ‘dry’ minor pentatonic, the outer frame of the box position. All the usual suspects can be found here; your root, flat 3rd , 4th, 5th and flat 7th. Not hugely exciting in itself, but it’s important you fully understand the groundwork. Note the incorporation of tones found in the major pentatonic: the major 3rd, and the major 6th. The flattened 5th, or blue note is also here. The resulting pallet is a bountiful selection of chord notes and color tones for you to paint over any chord progression. Simply put, providing you’ve identified the key signature of whatever it is you’re playing, the pentatonic will very rarely sound wrong. 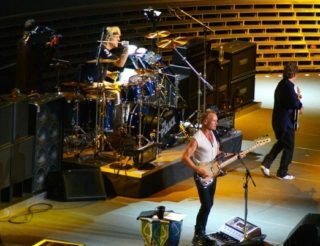 Many guitarists use it as a crutch incase they need to improvise on the spot or if they lose their place in a solo. It’s also a very expressive scale, and generates most if not all of the time-honoured guitar licks you associate with rock or blues. While the amount of notes within this pentatonic framework are finite, I encourage you all to try and develop your own voice with it. It’s absolutely brimming with potential. Trust me, nobody wants to hear grade-one pentatonic licks. You know the sort I mean. The uninspired, stock licks that kind of sound like Keith Richards if he suddenly lost all hand-strength and the will to live. It sounds musically weak and devoid of individuality. [pullquote align=”right”]Trust me, nobody wants to hear grade-one pentatonic licks. You know the sort I mean. The uninspired, stock licks that kind of sound like Keith Richards if he suddenly lost all hand-strength and the will to live. It sounds musically weak and devoid of individuality. [/pullquote] Look to the greats. I guarantee you that most if not all of your favourite guitarists are instantly identifiable by their pentatonic playing. Not premeditated lead-lines, but by how their hands ‘sit’ over these boxes and the wildly different sounds they curate not just by note selection, but through subtleties and nuances in their fingers. Hendrix single-handedly defined a new and electrified way of approaching the scale. His style was instantly recognizable; angular ‘box-based’ licks interspersed with experimental out-of-the-box runs. It was sloppy by today’s standards, but for the time his playing was revolutionary. Stevie Ray Vaughan took this style, cleaned it up, injected some serious speed and beefed it out with mega two-tone Albert King-inspired bends. Slash is another whose unorthodox approach to the scale is inimitable. Too rocky to be straight blues, too bluesy to be straight rock, you can pick out his playing from a mile away. His style is less choppy and lick-based, but instead more fluid, with his legato taking on his signature ‘rattle-like’ sound. Undeniably, each of these guitarists also had genre-defining tone, but the point is that they all shaped the pentatonic to create their unique sound. There’s a lot to be taken from that. If you’re up for it, we recommend checking out this video by Marty Schwartz that will help you get started. 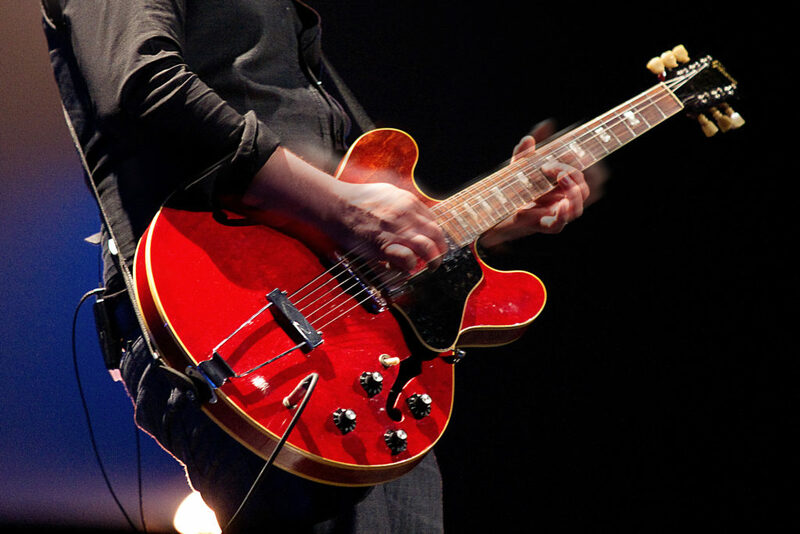 If you want to check out some songs that have a prominent pentatonic guitar riff, many of these examples are easy to play. Props to Fretboard Theory! Thanks, it’s fun to jam with the I IV V blues! Seems to work forward and backwards.